The City Medium Tech 2 by deLaCour is a pure and balanced timepiece that reflects the proficiency and expertise of Geneva based luxury watch brand: technique, creativity and elegance. Its elliptical architecture is consistent with the distinct and emblematic shapes of the brand. With its two time zones, this model features a harmonious dial. Especially created for businessmen, the City Medium Tech 2 is thin and can be worn on all occasions. A hand-stitched crocodile leather strap fits perfectly into the case, giving the watch an impeccable allure. Daring and elegant, it’s a perfect combination of personality and discretion. 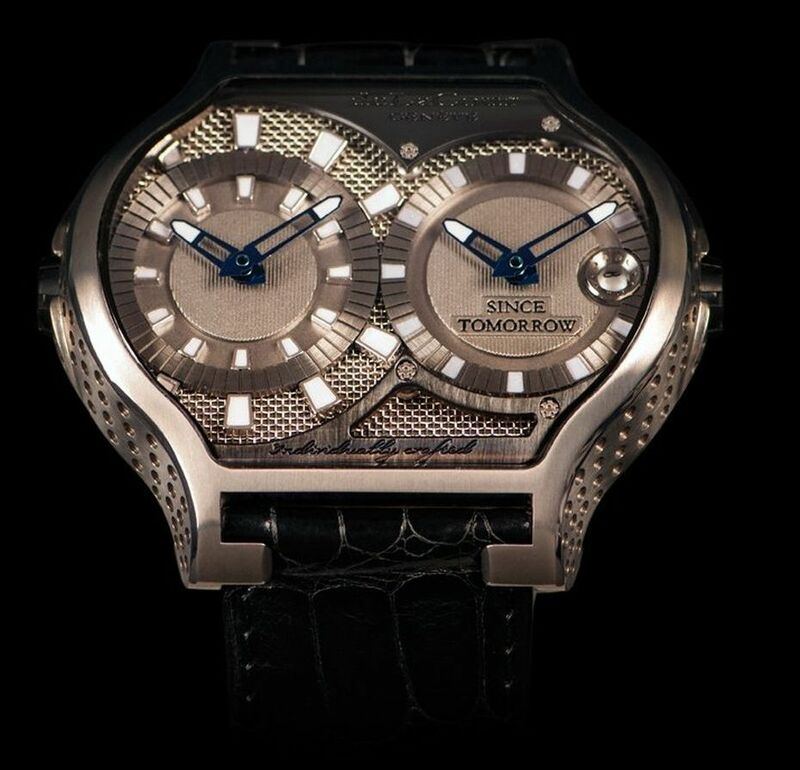 The chainmail decoration and mechanized appliqués featured on the dial give strength and character to this timepiece. Elegant engravings and layered plates differentiate each time zone through a specific design. The City Medium Tech 2 carries two independent automatic movements, which feature the essential information: hours, minutes, seconds and date. The two-time zones, located in the center of the dial are outlined at the top and bottom by an elegant umbrella-shaped plate. The matching metal plates are held above the dial by apparent screws, emphasizing the chainmail decorations on the bottom of the dial. The luminescent and open worked hands are in perfect harmony with the technique of this timepiece. Carefully placed, the glowing indexes are raised, ensuring high readability of the time. A simple and sober window at 3 o’clock indicates the date and elegantly completes the watch. 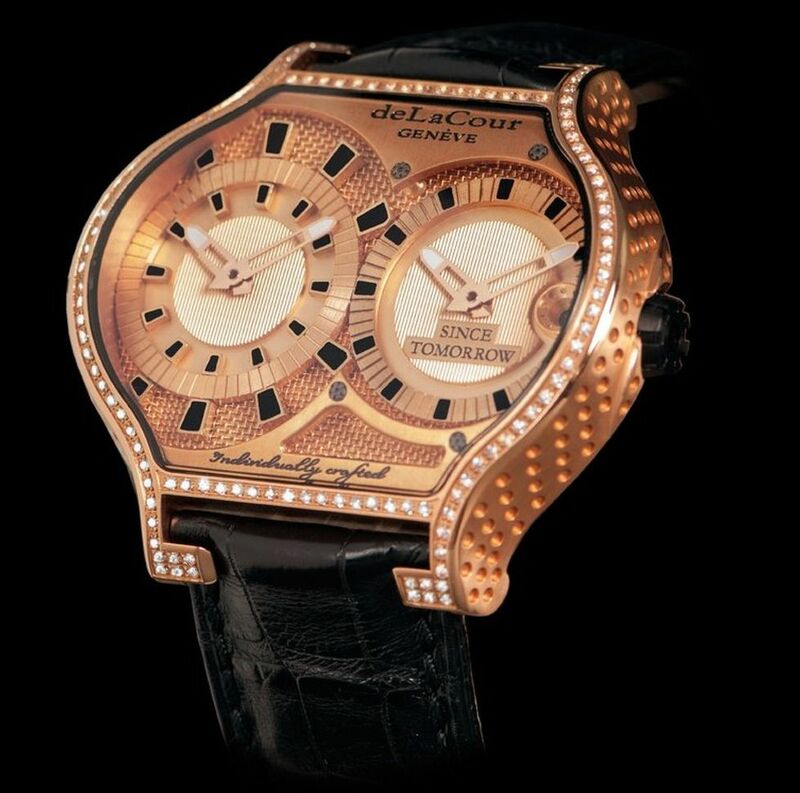 Finally, deLaCour discreetly signs this model with an engraved inscription, skill fully filled with black lacquer. The case is available in pink gold or titanium. 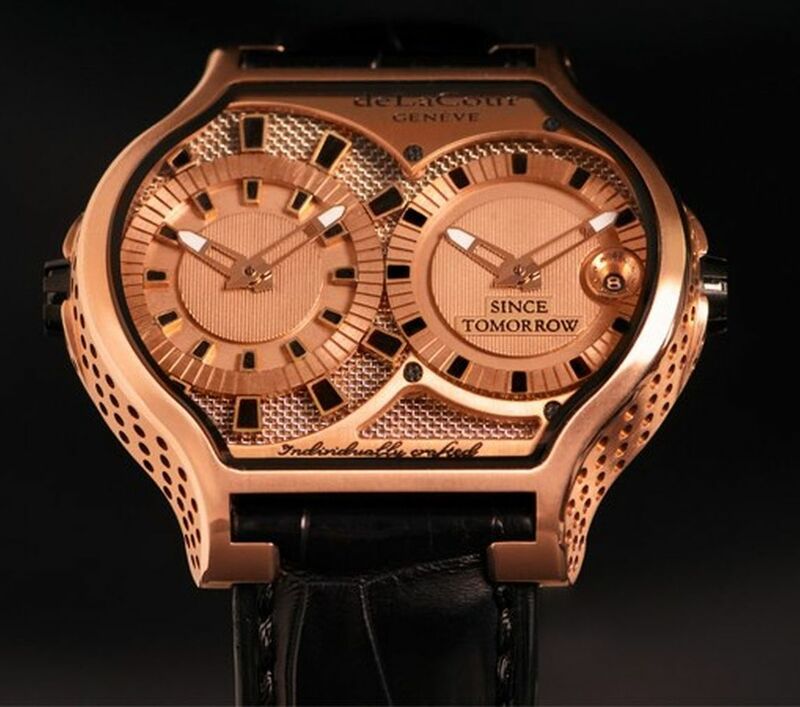 As for all deLaCour models, the case is slightly curved and offers a perfect fit to the wrist. Thin and discreet, two crowns located on either side fit the case seamlessly, thereby meeting the refined lines of this timepiece. Offering a unison ticking, the two automatic movements are subtly visible through the smoked sapphire crystal glass thus allowing a peek into the technique of this new model.